This is the fourth and final post in a series of blog posts written by students from my third year Evolutionary Parasitology unit (ZOOL329/529) class of 2013. This particular post was written by Sally Thorsteinsson on a study that investigated how an intertidal parasite with a complex life cycle might respond to global warming (you can read a previous post about toxic birds and their lice here, a post about bees protecting themselves against fungal parasites by lining their hives with resin here, and how an avian malaria parasite might make its bird host more attractive to mosquitoes here). Intertidal habitats are tough places to live: one minute you may be submersed, buffeted, and chilled by salt water, the next baking under a hot, drying sun. However, global warming is predicted to turn up the heat even more on those that inhabit these environments. The tidal flats on the South Island of New Zealand are the habitats of the parasite trematode Maritrema novaezealandensis and the three hosts necessary for it to complete its life cycle – mudsnail Zeacumantus subcarinatus, amphipod Paracalliope novizealandiae (a type of sandhopper-like crustacean) and gulls which are its final host (this life cycle is described in a previous Parasite of the Day blog post here). Trematodes are strongly influenced by the heat, and some studies have predicted that they will flourish with global warming and increase their impact on intertidal systems. However, parasites cannot be looked at in isolation, but considered as part of the ecosystem, which may also be temperature sensitive. For M. novaezealandensis itself, there may be a perk to global warming, as long as temperatures stay within its optimal range. When the water in rock pools is comfortable for us to roll up our jeans and paddle (between 20 and 25 °C), M. novaezealandensis thrives. At present this happens during low tide on hot summer days and the warmth sparks the release of multitudes of cercariae (free-swimming trematode larvae) into the water from the bodies of their snail hosts, ready to drill their way into their next host, the amphipod. In such temperature, the cercariae survive for relatively long periods, are at their infective peak and develop well inside the amphipods. These conditions are expected to occur more often and for longer periods with global warming - not particularly good news for the host snails and amphipods of M. novaezealandensis bombarded by increased numbers of this parasite and suffering death and destruction (particularly the amphipods) as a result. But the heat gets all too much for M. novaezealandensis at temperatures greater than 30 °C when there are still many cercariae but they infect amphipods at lower rates and their lifespans are shortened. The amphipods also die at such heat, making it harder for the parasites to find their hosts and live in them long enough to develop. 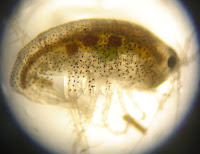 At present these extremes are rare, but the increase in high-temperature days as predicted would disrupt the parasite’s life cycle further and decrease the population of amphipods. As amphipods are an important food source for other animals, as well as the decomposers of the intertidal world, their demise can have widespread consequences. Who knows what changes global warming will be bringing to the wider ecosystem; lab experiments, such as the one providing these results in this study, can only offer an indication. Further research into the effects of climate change on host-parasite systems will be important given the pivotal role of parasites and the complexity of the ecosystems that they are part of. Perhaps the behaviour of the snail, amphipod and gull hosts will also be affected by temperature changes, sea level rise or alterations in habitats and such selection pressure over generations of hosts and parasites will turn up the heat on evolution, resulting in offspring that may be quite differently to those that are alive today. Studer, A., Thieltges, D. W., & Poulin, R. (2010). Parasites and global warming: Net effects of temperature on an intertidal host-parasite system. Marine Ecology Progress Series 415: 11-22. This is the third post in a series of blog posts written by students from my third year Evolutionary Parasitology unit (ZOOL329/529) class of 2013. This particular post was written by David Rex Mitchell on a paper published just this year on how an avian malaria parasite might make its bird host more attractive to mosquitoes which are the parasite's vector (you can read a previous post about toxic birds and their lice here and a post about bees protecting themselves against fungal parasites by lining their hives with resin here). One of the aspects of parasites that people tend to find a little more disturbing is the idea that they can control the minds of other animals. Although this may seem like the stuff of science fiction, this is indeed sometimes the case. For those parasites that live inside other animals, there are often several stages to their lives and each of these stages may require the use of a different type of animal. This presents a challenge in getting from one animal to the next and so if a parasite can influence the behaviour of one animal in some way, making it easier to reach the next, this is incredibly advantageous. Many parasites have evolved abilities to do just this. For example, some blood-sucking insects infected with certain parasites are known to bite more frequently than when uninfected, helping to spread the disease to more animals. 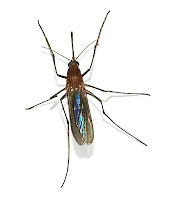 This is seen in malaria-infected mosquitoes, tsetse flies infected with sleeping sickness, and plague-infected fleas. But is it possible that a parasite can also influence a healthy, uninfected animal’s behaviour? The paper featured today attempts to address this question. 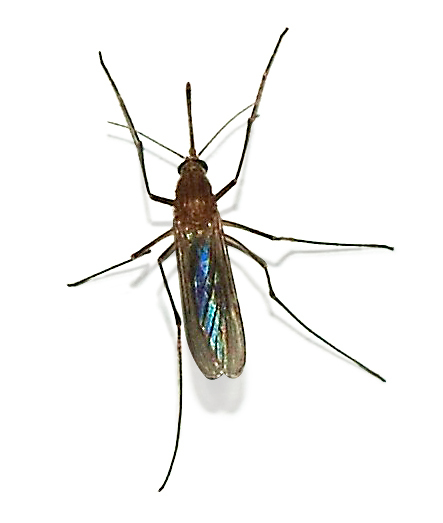 Researchers used a species of avian malaria (Plasmodium relictum - a parasite that has been previously covered on the blog by this post here) and its natural mosquito carrier (Culex pipiens) to find out if malaria-infected animals are more attractive to mosquitoes than healthy, uninfected animals. This species of malaria is spread among birds via its mosquito carriers and thus the researchers chose canaries to carry out the experiment. Pairs of canaries, one infected with the parasite and one uninfected, were exposed to uninfected mosquitoes to see which bird they would prefer to feed on. The mosquitoes mostly fed on only one animal per sitting, so the blood inside their bellies could be removed and the DNA analysed to determine which bird it fed upon. The experiment was carried out on the day the birds were injected with the parasite, as well as 10 days and 24 days after injection, so as to monitor any changes as the parasites matured inside them. From this experiment the researchers discovered that, not only did the mosquitoes clearly prefer to feast on the malaria-infected canaries, but also this behaviour became more prominent as the malaria parasites mature within the canary and become capable of crossing into a mosquito. The researchers suggest that the malaria parasite influences the mosquito’s decision to feed on the infected animal, assisting its transfer to said mosquito – the next stage in its life-cycle. The mechanism used to achieve this has not yet been determined but the researchers suggest that the parasite may alter the odours that are emitted from the host animal, enticing the mosquitoes to choose its infected animal over other uninfected animals. If these odours can be identified and reproduced, they may prove very useful in control of malaria in the future, for example in mosquito traps. So is this an example of crazy sci-fi mind-controlling by parasites? Ok, so mosquitoes may not exactly be renowned for their calculated decision making skills. But the results of this experiment were still able to show us how the malaria parasite can influence a healthy mosquito’s decisions, offering further insight into the awesome manipulative powers of parasites. Cornet S, Nicot A, Rivero A, & Gandon S (2013) Malaria infection increases bird attractiveness to uninfected mosquitoes. Ecology Letters 16: 323 – 329. This is the second post in a series of blog posts written by students from my third year Evolutionary Parasitology unit (ZOOL329/529) class of 2013. This particular post was written by Karen McDonald on a paper published in 2008 on how bees use resin to protect their hive against fungal parasites (you can read the previous post about toxic birds and their lice here). 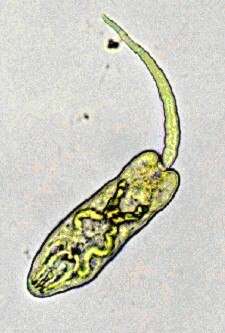 Animals have evolved many different strategies to fight parasite infections; from eating tough or poisonous leaves (which would normally never be chosen as part of their diet), dirt bathing, grooming themselves with plants that contain chemicals that kill parasites, living in hostile environments that parasites can't tolerate, to drinking toxic substances like alcohol to kill internal parasites. Animals in general are individuals and care only for their own personal well-being and so the parasite-ridding strategies animals use really only affect their own health and well-being. But bees, on the other hand, are different. Bees are communal animals and each bee is an important part of the hive community. The article I am going to talk about today shows that bees don't act on a self-motivated level where they are only concerned with their own well-being, instead bees work only to improve and support the whole hive community. Wild bees always smother the inside of their nests with sticky plant resin and the reason for this was never really understood. Domesticated bees don't use much, if any resin at all. They have been selectively bred to not use it because the sticky resin makes opening the hive and removing the honey and combs very difficult. But domestic bees are also plagued by many, often destructive, parasites. In 2008 researchers decided to document whether the amount of plant resin that domestic bees use in their hives has an effect on fungal parasite levels in that hive. Two groups of hives were set up; the first group of 12 had the inside of each box painted with thick resin to replicate the nests of wild bees, the second group of 11 boxes were only painted with the type and quantity of resin used by commercial apiaries. Bees from both groups were fed with pollen infected with Chalkbrood, which they ate and/or carried back to their hives. Chalkbrood (Ascosphaera apis) is a fungal infection of bee larvae, causing them to die and mummify in the nest (see photo on the right). Adult bees are not affected by the parasite but they do carry it in their bodies and drop spores throughout the nest infecting young bees. Normally, as mentioned above, infected animals are usually only concerned with their own well-being and so the researchers were interested in seeing whether the adults would react to the threat to the larvae or ignore the parasite menace because it did not affect them personally. Within days, the bees immediately began collecting more resin for their nests. Normally, there are only a few bees in each hive that forage for resin, the majority forage for pollen or nectar. Bees do not eat resin; its only function is to line the nest, so not much energy is used by the hive community to collect it. But when the hive is under threat from a parasite like Chalkbrood, more bees begin to forage for resin and a lot of energy is used to find it. The nests painted with resin, although infected at the same level, also had a reduced level of infection compared to the commercial standard nests, but the level of infection in all nests dropped as the amount of resin in the nest increased. The bees were using the resin as a form of social immunity rather than self-immunity. It has been a while since we had a guest post at the Parasite of the Day blog (in fact the last guest-contributed post date back to May 2011), but in the next few weeks I will be bringing you a series of posts from guest contributors. Earlier this year, I ran my third year Evolutionary Parasitology unit (ZOOL329/529) for the first time. One of the assessments I set for the students who took that unit was for them to summarise a paper that they have read, and write it in the manner of a blog post, much like the ones you see on this and other blogs. I also told them that the best blog posts from the class will be selected for re-posting (with their permission) here on the Parasite of the Day blog. I am pleased to be presenting these posts from the ZOOL329/529 class of 2013. To kick things off, here's a post by Bianca Boss-Bishop on a paper published in 1999 on toxic birds and their lice. Birds are host to an impressive diversity of external parasites, from insects (including lice, fleas, bugs and flies) to mites, ticks and even fungi and bacteria. These parasitic organisms can have severe negative effects on host fitness. Therefore, it is not surprising that birds invest a lot of time engaged in behaviours such as grooming, preening, dusting and sunning in attempts to rid themselves of their ectoparasites. A handful of unique birds from the genus Pitohui have an interesting physiological adaptation that may assist in the fight against parasite infestation: feather toxins. Yes, toxic birds. The six species of Pitohui, which are endemic to New Guinea have been found to carry toxin in their skin and plumage. These are the same potent toxins as those found in the skin of poison dart frogs (Phyllobates spp.) and are some of the most toxic natural substances known. The toxin present in the Pitohui is known as homobatrachotoxin and like all batrachotoxins is a neurotoxic steroidal alkaloid capable of depolarising nerve and muscle cell membranes. The level of toxins present in Pitohui tissue varies between species and geographic location. The most toxic species is the hooded pitohui (Pitohui dichrous), from which merely handling an individual can cause numbness, sneezing, and irritation of the eyes and sensitive mucous membranes. It has been hypothesised that the high proportions of toxin present in the Pitohui skin and feathers could provide the bird with a barrier from ectoparasites that live and feed on skin, feathers and subdermal blood supplies. John Dumbacher, current curator and department chair of Ornithology and Mammology at the California Academy of Sciences was the first to test if the presence of toxins in Pitohui feathers and skin would deter or kill chewing lice (order Phthiraptera). In order to investigate this he conducted a series of choice and lifespan experiments. Dumbacher found that when individual lice in the laboratory were given a choice of two feathers (one toxic Pitohui feather and one non-toxic non-Pitohui feather) there was a statistically significant preference against feeding or resting on the toxic feathers. Lice exposed to the highly toxic feathers of P. dichrous rarely showed signs of eating, with many becoming immobile and inactive. In some cases the louse would simply drop off the toxic feather. In a natural setting, immobility and lower feeding rates reduces the damaging effect of the lice and may even allow the birds to more easily remove or dislodge the parasites mechanically by preening or flying. Since this part of the study showed that the lice exhibited an active choice against the naturally toxic Pitohui feathers we can conclude that homobatrachotoxin has the potential to act as a repellent against these parasites. Dumbacher also determined that the natural levels of homobatrachotoxin in Pitohui feathers greatly increased louse mortality. The results of the lifespan experiments showed that the mean lifespan of lice exposed to feathers of either high or low level toxicity was half that of those on nontoxic feathers. Interestingly, the mean lifespan of the lice on the toxic feathers was similar even though the toxin levels in P. ferrugineus are ten times lower than P. dichrous. Therefore, Pitohui feathers with lower toxin levels may not have been potent enough to repel lice during the choice experiments but were as effective in increasing louse mortality as the highly toxic feathers. Increased mortality in lice could have many benefits for the host. Less time spent on the host will reduce the negative effect of each individual louse. One observation from the study was that non-toxic feathers showed obvious damage from lice feeding. This may be due to the extended life span offering additional feeding time, or the lice simply find nontoxic feathers more palatable. Further investigations may provide insight into additional benefits, for example whether or not the potent toxin is able to reduce louse fecundity. 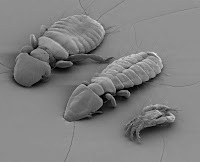 If mating in lice is decreased then subsequent generations of lice are also reduced. Smaller populations would cause less irritation to the host and also be less visible to potential mates. Additionally, less ectoparasites would reduce time spent mechanically removing them and more time to invest in other activities. The results of Dumbacher's study suggest that the naturally occurring homobatrachotoxin found in the skin and feathers of the Pitohui repels and kills lice. The presence of a powerful toxin in skin and feathers has the potential to create a formidable barrier and protect the bird against infestation from ectoparasites. Dumbacher, J. P. (1999). Evolution of toxicity in Pitohuis: I. effects of homobatrachotoxin on chewing lice (order: Phthiraptera). The Auk, 116: 957-963.